iPad Video Converter - iPad Converter to convert video to iPad MP4. iPad Video Converter, convert video to iPad MP4 format. 3herosoft iPad Video Converter is specially designed for iPad users to watch any popular videos and movies on iPad. With this iPad Video Converter, you can perfectly convert AVI, MPEG, WMV, MKV, FLV, VOB, DivX, MP4, MOV, RM, RMVB, ASF, 3GP to iPad MPEG4, H.264, MOV video files. And this iPad Converter program allow you to extract and convert audio files such as WMA, RA, AC3, OGG, APE, MP2, CDA to iPad MP3, WAV, M4A audio format and transfer audio files into iPod library. 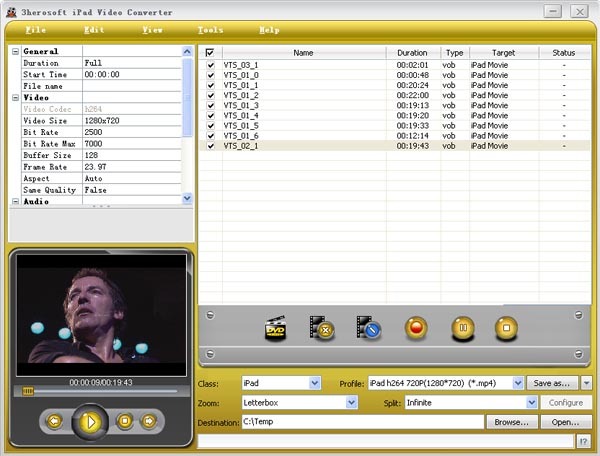 To create general video to iPad in your own way, iPad Video Converter also provides you lots of profiles with optimized output parameters to suit your iPad exactly, such as Video and Audio Encoder settings, Sample Rate, Bit Rate, Channel and so on. Convert almost all video to iPad, such as AVI, MPEG, WMV, DivX, MOV, RM, VOB to iPad MP4, MOV video. Convert audio and video to iPad music MP3, M4A, WAV from multiform audio files like MP3, WAV, WMA, RA, OGG, AAC, AC3, MP2. The output iPad video and audio files keep best compatible with iPad, iPad 2, the new iPad, iPad 4, iPad mini, iPod touch, iPod nano 5G, iPod shuffle, iPhone 3, iPhone 4, iPhone 5, iPhone 5S/5C, iPhone 6/6 Plus and AppleTV. Convert the segment you want with this iPad video converter by setting the start time and duration to remove the unwanted. It offers several Split Modes for you to split one file into video parts to fit your iPad perfectly. Adjust the general and advanced parameters including Bit Rate, Frame Rate, Sample Rate, Aspect, Codec to customize output quality. Multithreading and batch conversion provide super fast conversion speed due to multi-core CPU support. Faster than any other iPad video converter software. User-friendly interface without any complicated settings. Convert video to iPad with just a few clicks. How to convert video to iPad 2 MP4 files?